Trousers by PETER HAHN. CORNELIA fit. 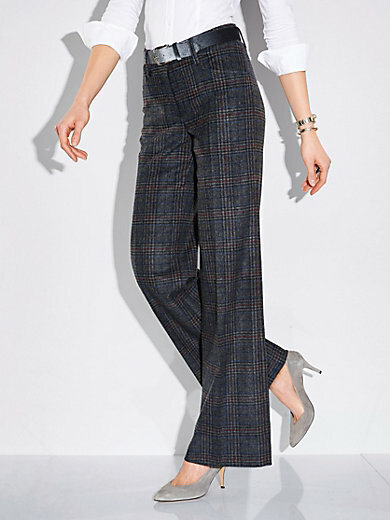 Soft, warm and bang on-trend Marlene style trousers with wide leg. Elaborately finished with waistband extension, belt loops, permanent crease and 2 slash pockets on the front. In a stretchy and low-crease material blend made of 67% wool, 30% polyester, 3% elastane. Belt not included. Front trouser lining up to the knee made of 100% nylon. Inside leg length in regular sizes approx. 33 ins., in short sizes approx. 31ins. Ankle width approx. 21ins. The trousers are machine washable.